This paper investigates the market power and the welfare performance of the deregulated wholesale electricity market of California between 1998 and 2000 by incorporating the structure of the transmission network. While Wolfram (1999), Borenstein, Bushnell, and Wolak (2002) and Joskow and Kahn (2002) treat the difference between the market price and the marginal production cost of the marginal generator as the indicator for market power, we decompose the difference into the market power and the inefficiency arising from the network constraint. Based on public data for the market from 1998 to 2000, we demonstrate that the welfare loss due to the finite transmission capacity accounts for 29-38% of the total annual welfare loss, while the remaining portion can be explained by the market power exercised by the generators. In this paper we ask if consumption of energy for space heating by households is habit forming. A model of intertemporal consumption allocation allowing for habit-forming preferences is estimated on a register-based panel data set with high quality information about consumption of natural gas for a sample of Danish households. Results indicate that preferences are weakly habit forming. 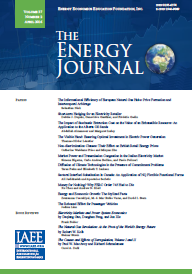 This paper analytically derives a Supply Function Equilibrium (SFE) of a real-time electricity market with multiple firms and asymmetric production capacities. There is a unique SFE, which is piece-wise symmetric when firms have identical constant marginal costs. It is believed that some of the properties of the derived SFE are valid for real-time markets in general. Firms� capacity constraints bind at different prices (i). Still, firms with non-binding capacity constraints have smooth residual demand (ii). Approximating an asymmetric real-time market with a symmetric one, tends to overestimate mark-ups for small positive imbalances and underestimate mark-ups for large positive imbalances (iii). Turkish electricity reform is entering a new phase through the Turkish Government�s proposal to create 21 new distribution companies, 18 of them by merger. Two aspects of merger analysis are the operational cost savings and the potential production efficiency gains. This paper concentrates on the second aspect and uses a recently developed methodology to assess the potential effect of these mergers and whether these mergers are efficiency enhancing. This is performed by comparing the actual efficiency levels of observed distribution companies with the merger of proposed aggregated companies. The model is calibrated on panel data from 1999 to 2003 which include measures of physical capital and labor inputs, as well as customer and energy related outputs. The results indicate potential for considerable efficiency gains from the proposed mergers. One of the most critical concerns that customers have voiced in the debate over real-time retail electricity pricing is that they would be exposed to risk from fluctuations in their electricity cost. The concern seems to be that a customer could find itself consuming a large quantity of power on the day that prices skyrocket, resulting in a high monthly bill. I analyze the magnitude of this risk, using demand data from 1142 large industrial customers, and then ask how much of this risk can be eliminated through various straightforward financial instruments. I find that very simple hedging strategies�forward purchase contracts that are already used with many RTP programs�can eliminate more than 80% of the bill volatility that would otherwise occur. I then show that a slightly more sophisticated application of these forward power purchases can significantly enhance their effect on reducing bill volatility. Adoption of real-time electricity pricing�retail prices that vary hourly to reflect changing wholesale prices removes existing cross-subsidies to those customers that consume disproportionately more when wholesale prices are highest. If their losses are substantial, these customers are likely to oppose RTP initiatives unless there is a supplemental program to offset their loss. Using data on a sample of 1142 large industrial and commercial customers in northern California, I show that RTP adoption would result in significant transfers compared to a flat-rate tariff. When compared to the time-of-use rates (simple peak/offpeak tariffs) that these customers already face, however, the transfers drop by up to 45%; even under the more extreme price volatility scenario that I examine, 90% of customers would see changes of between a 4% bill reduction and an 8% bill increase. Though customer price responsiveness reduces the loss incurred by those with high-cost demand profiles, I also demonstrate that this offsetting effect is unlikely to be large enough for most customers with costly demand patterns to completely offset their lost cross-subsidy. The analysis suggests that adoption of real-time pricing may be difficult without a supplemental program that compensates the customers who are made worse off by the change. I examine possible �two-part RTP� programs, which allow customers to purchase a baseline quantity at regulated TOU rates, and show they can be used to greatly reduce the transfers associated with adoption of RTP. What Oil Export Levels Should We Expect From OPEC? We analyze the levels of oil exports that should be expected from OPEC over the next 25 years. We search for a long-term, market-adaptive, robustly optimal strategy that best serves OPEC's interests, and conclude that OPEC export profits will be higher if OPEC expands its oil exports by enough to maintain OPEC exports share of non-OPEC demand. Yet the incentives for this export expansion are relatively small only a few percent in terms of discounted export profits and it requires that OPEC be farsighted, because the higher export profits from faster export growth wonot be significant within the next decade. Moreover, if OPEC does maintain its exports share of non-OPEC demand, the continued rapid growth of OPEC's own oil consumption will require that OPEC oil output will have to increase 60% by 2030, which will be a major challenge.